Like many young rural Ugandans, Christine Kyakunda needs more land. She and her husband farm 1.5 acres - some inherited, some bought, some borrowed from her widowed mother-in-law - but it is not enough to provide for her family. "My kids now eat potatoes, cassava and beans," the 23-year-old said of the crops, which are eaten by the poorest, and that they grow on one-third of their holding in Kyampungu, a small village in the country's southwest. The remaining two-thirds is covered in coffee shrubs. Coffee has become lucrative in recent years, and more land would mean more money. Then, she said, her children - aged six and two - "would be eating bread, milk with sugar, and eggs". More land would also allow him to buy a taxi, he said. That would boost his status from "a boda boda rider to a taxi driver". "We will engage communities through workshops to sign community land-use agreements that give youths and women access to land," said project coordinator Amodoi Vincent. With those agreements in place, young men and women would not only "have access to land but will also have control over it," said Viney. "Some of the farmers we have met have tens or even hundreds of acres of land, but some of the young farmers are working on less than two or three acres," Viney said. Farming is about access to land, said Fredrick Muhanguzi, the farmers' organisation specialist at the ministry of agriculture, animal industry and fisheries. "This is the reason coffee-farming is looked at as an enterprise of old people," he said, adding that when the ministry hands out free coffee seedlings, young people are reluctant to take them, because they have nowhere to plant them. "Coffee farming is only in the hands of those aged 60 and above," he said. The project will tackle a linked issue: unemployment. Some 78 percent of Uganda's 37.6 million people are under 30, the 2014 census showed. 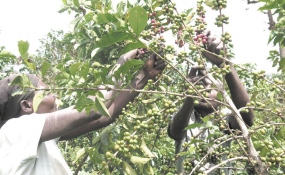 "Even if it is half an acre and you give it to your child to grow coffee now, in a period of three years it is a done deal of harvesting coffee," Rukundo said. One acre, then, can generate average monthly revenues of up to $500, a large sum in Uganda where the employed earn an average 416,000 shillings ($110) a month, according to the Uganda Bureau of Statistics' national household survey of 2013. "We will help them ... access coffee-processing machinery to process and add value to their coffee - and be able to supply the bigger markets nationally and internationally where they are able to get better prices," he said. He is enthusiastic about the project's ability to provide land and employment to young people. The solution, he said, was heavy taxation of unused land "to force (owners) to give it to youths at a small fee or no cost to make it productive", and for government to lease its land at low cost to young people for farming.